At Canadian Niagara Hotels we know that organization and planning are essential to the success of any event. Our dedicated Sales and Conference team is here to help you every step of the way and provide you with all of the resources, and information needed to help make your meeting or conference both professional and inspiring. We turn ordinary meetings into memorable experiences to ensure that your message will last. Whether you are planning an intimate board meeting or an elaborate production, we mix creativity with the right technology to make your meeting successful. Canadian Niagara Hotels partners with PSAV® Presentation Services, to guarantee an exciting, stress-free and rewarding communications experience. PSAV® Presentation Services is a leader in the industry and invests in the newest technology to ensure all of your meeting needs are met. This includes a full line of projection, lighting, staging, audio equipment and numerous meeting essentials. All of the state-of-the-art equipment is maintained and operated on-site by dedicated event technology experts. You can rely on our expertise to successfully deliver your meeting message. Niagara Falls is home to a number of spectacular restaurants and eateries where you'll find mouthwatering cuisine in one-of-a-kind settings. View our Niagara Dining Guide to learn more. Canadian Niagara Hotels offers ample on-site parking that is both covered and secured. Infuse your next event with positive energy by integrating a unique team building option into your agenda. These one-of-a-kind experiences take full advantage of the spectacular indoor and outdoor settings that Canadian Niagara Hotels has to offer. Team building is a sure way to foster effective relationships, elevate morale, and make your experience unforgettable. Canadian Niagara Hotels is situated in the heart of the international border city of Niagara Falls, Ontario. It's easy and convenient to drive to Niagara Falls from four international airports: Toronto, Hamilton, Buffalo and Niagara Falls. 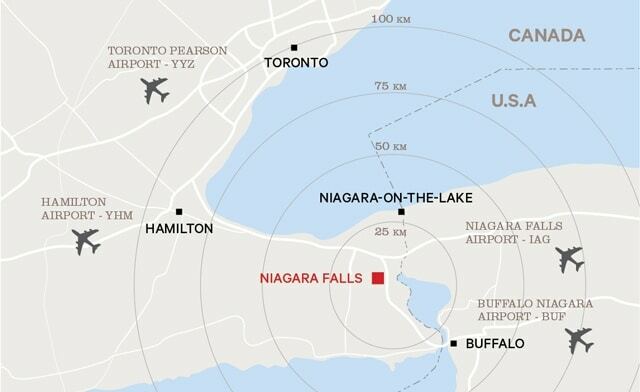 If you're driving, the city is an easy 85-minute drive from Toronto, and only 40 minutes from Buffalo. Niagara Falls is directly linked to major highways in Canada, and three international bridges that will get you to and from major routes in the United States. Niagara Falls is directly linked to major highways in Canada and the United States and is connected to the USA by three International Bridges. VIA Rail and Amtrak provide daily service to Niagara Falls with connections throughout Ontario, Quebec and New York. Niagara Falls bus terminal services Coach Canada, GO Transit, Greyhound Canada, Megabus, and Niagara Transit. Convenient airport transportation and preferred discount pricing is available for all of your transportation needs when booking with Canadian Niagara Hotels. Local transportation partners offer sedan, limousine, shuttle and coach services. A valid passport is now required for all visitors at all entry points of access to Canada, and is mandatory for all flights within North America. At designated points of entry visitors may also have the option of presenting an enhanced driver's license, NEXUS, FAST/Express or SENTRI enrolment card. For more information, visit the official site of the US Department of State or Canada Border Services Agency. Enter your email address below to receive exclusive deals and promotions from Canadian Niagara Hotels. You may unsubscribe at any time by using the "Unsubscribe" link at the bottom of our emails.